If you’ve ever spilled red wine, juice, or any other any red liquid, you know have difficult those stains can be to remove. It seems like your carpet is going to be bright red forever. Red dyes and stains are by far the toughest of any stain to remove, especially at home using standard cleaning products. You can try all of the best stain removal tips at home, but sometimes you just can’t get the stains out yourself. Fortunately, most red stains aren’t actually permanent; they just require expert care to remove or minimize. 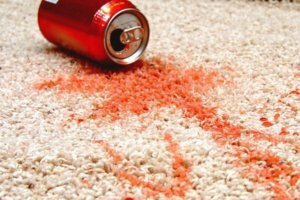 North American Chem-Dry carpet cleaners have experience in removing the toughest of red stains, from red wine to tomato sauce to nail polish. We’ve seen it all, and we’ve been able to remove or minimize virtually all stains. We use the safest and most effective cleaning solutions in the industry to gently but effectively remove stains without damaging your carpet or using harsh chemicals that are harmful to your home, family, and the environment. We have experience in removing red stains from carpets and upholstery, and we’ll willing to attempt any job. If you have a tough red stain that needs to be removed in the Sonoma area, give us a call at 707-938-9614 or contact us so we can talk about what we can do for you! After all, if we can’t get it out, no one can.